Bathroom Remodeling or Renovating is arguably one of the best investments you can make in your Michigan home. 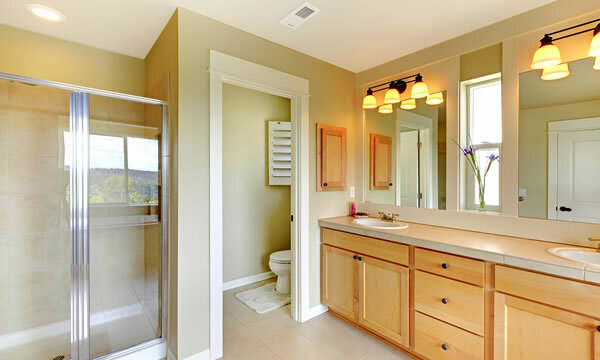 Bathroom remodeling consistently offers one of the highest returns out of many other home remodeling projects. It’s definitely no surprise that most home improvement experts would also agree that remodeling your bathroom offers the homeowner the most bang for their buck. Maybe you want to give an old boring bathroom a face lift, or maybe you’d like to add a bathroom where there never was one before! Hubble Construction and Restoration can complete any size or scale of bathroom remodeling project within our Central Michigan and the Lower Peninsula service area. Whether you want to have that spa like setting in your master bath with beautifully laid tile floors or maybe it’s adding a skylight, a new vanity, double sinks or that giant soaker tub you’ve always wanted. We will help you choose the perfect fixtures and colors, vanities and countertops. Hubble Construction and Restoration can totally makeover your bathroom. Hubble Construction and Restoration has plenty of experience remodeling bathrooms and we’d love to have the opportunity to transform your bathroom into the one you’ve seen in a magazine, on TV or at a friends house, or maybe you have your own plans… We can help you make them a reality! Why Choose Hubble? As a building contractor that has specialized in restorations for so long we’ve repaired literally hundreds of bathrooms that were completed by contractors who cut corners, and did other un-scrupulous things that resulted in costly bills for a homeowner down the road. In short… We do everything the way it’s supposed to be done.